Ancestral records for Irish Presbyterians do not, typically, date much further back than the 1820s. Which is not to say there are NO really old registers. The earliest surviving register is for the parish of Antrim in County Antrim and dates from 1674. That is a rarity, however. Few go back even to the 18th century, let alone the 17th. The reality is that by far the largest proportion of Presbyterian registers don't start until the 19th century. And just because one register from a particular congregation starts in one year there's no guarantee that all its documents start in that year. You don't have to look far to find quite major differences. The Fisherwick, Belfast, baptism register starts in 1810, but its marriage register didn't start until 1845 - the year civil registration began. In the nearby Rosemary Street congregation, baptism registers survive only from 1854. But yet it's marriage register dates from 1741. In Killeshandra, County Cavan, the registers are very fragmented; baptisms date from 1841 but the surviving marriage register contains only ceremonies from 1741 to 1776. Presbyterian registers are similar to those of other denominations in that they were not standardised in format or content, there are sometimes huge gaps in the years recorded even in a single congregation, and inconsistency means there may be significant changes in the information recorded even by the same minister. Also, legibility  either due to the passing of time, the level of care taken to preserve these valuable ancestral records, or the minister's standard of handwriting  can be an issue, especially with the earliest registers. Due to a long period of religious and civil presecution in Ireland, many pre-1830s baptisms, marriages and burials of Irish Presbyterians will be found in Church of Ireland registers. The brief history in the right-hand column explains some of the problems faced by Irish Presbyterians and the reasons some of the ancestral records you seek may not be available. See (below) the brief history which explains some of the problems faced by Irish Presbyterians and the reasons some of the ancestral records you seek may not be available. The contents of baptism records differ from parish to parish. Some contain only the child's name, the father's full name and the mother's first name. Some go a little further, especially later registers, to record the parents' residence, the mother's maiden name and the name of godparents (sponsors). The date of birth may also be given, especially if it was some time before the baptism. This is usually the case when a Presbyterian family had 'saved up' their children, probably to save money on the Minister's fee, for a multiple baptism ceremony. Presbyterian marriages sometimes provide very detailed ancestral records, but you might have to hunt for them as the ceremonies were often conducted in secret. The earliest registers usually provide only the names of the couple and the father of the bride, while later ones – certainly from 1845 – provide the names and residences of the bride and groom, their marital status, ages and occupations, and the names and occupations of their fathers. Advance notice of Presbyterian weddings had to be sent to the Kirk Session. These notices were then recorded in the Session Minute Book. These Books survive, so it's worth checking them for ancestral records. Burial registers are uncommon as few churches had burial grounds. The Public Record Office of Northern Ireland (PRONI) has microfilmed nearly all registers of Ireland's Presbyterian congregations. According to the Presbyterian Historical Society (see below), PRONI's 'coverage is so extensive that there are relatively few congregations whose records have not been deposited in some form in PRONI. So, clearly, PRONI should be your first stop. The Presbyterian Historical Society (PHSI) has copies of all of the microfilms of Presbyterian registers held by PRONI and these can be viewed at the Societys office in 26 College Green, Belfast BT7 1LN, Northern Ireland. While the Society can provide genealogical advice and guidance, it does not have a full research service. In addition to the PRONI microfilms, a small number of Presbyterian records are only available at the PHSI office. 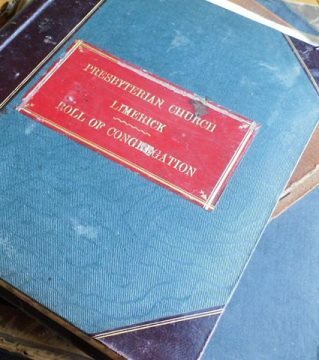 A list of these registers and a guide to the Society's collection can be found at their website www.presbyterianhistoryireland.com. These include some baptism and marriage registers and some very early Session Minute Books. A small number of pre-1900 registers and other records are still held by the local Minister. Local genealogy centres: Transcriptions of some registers may be online at RootsIreland.ie. Check the online sources menu for the relevant county to see if the congregation you're interested in is included in the database. General advice on finding ancestral records in Irish church documents. 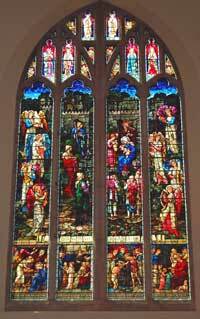 The Irish Presbyterian Church was established in the early 17th century by Scots who had settled in Ulster, especially in counties Antrim and Down. This area remains the stronghold of the Presbyterian Church in Ireland to this day. Like the Roman Catholic Church, the Irish Presbyterian Church was subject to a lot of restrictions, collectively referred to as the Penal Laws. Indeed any church that did not conform to the practices of the Established (or State) Church ie the The Church of Ireland (the Anglican Church) suffered repression. These difficulties were the reason many Ministers did not maintain registers in the first two centuries after Presbyterianism arrived in Ireland. They are also the reason that many ancestral records for your Presbyterian family may be found in local Church of Ireland registers. According to the Penal Laws, Presbyterian Ministers had to perform marriage and burial services under Church of Ireland ceremonial rites. If they didn't, the ceremonies could be considered invalid. In the case of weddings, any children of the contested union could be declared illigitimate. Apart from the social stigma of 'living in sin' and producing 'illegitimate' children, lines and rights of inheritance could be adversely affected. In response to the law, Ministers often performed marriage ceremonies in secret. Similarly, Presbyterian funeral services could take place only if a Church of Ireland Minister was also present. Their churches were not allowed to have their own graveyards. A gradual reform of the Penal Laws in the early 19th century relaxed the Church of Ireland's hold over baptism, marriage and burials and Ministers began to keep their own registers. In 1845, Presbyterian marriages were recognised by the state, but it was not unti the dis-establishment of the Church of Ireland in 1869 that complete freedom of worship was guaranteed.